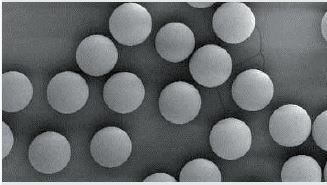 “Gist”: Reduction of monomeric MDI in moisture curable prepolymers by addition of amino functional silica particles. Why it is interesting: As noted in some previous posts in this blog (*) reduction of monomeric isocyanate from moisture curable systems is an important trend in PU systems development. The current invention solves this problem by adding isocyanate-reactive SiO2 particles to the prepolymer composition. The particles have a preferred average size of 50-60μm, are (nano-)porous with a large specific surface area and have been chemically modified with (preferably) aminosilanes to make them amino-functional. Particles of this type with different functional groups are commercially available under the QUADRASIL tradename. (*) Note that you can use the ‘search’ or ‘category’ boxes on the right (or in case of a mobile device on the bottom) of this page to help you navigate the site.